The Phin Park Apartments from above in 1960. Image: adapted from City of Toronto Archives, Series 12, Image 60. If the built environment is not an archive, then it’s a darn good book. At least that’s how it has always felt to me. Not only are all aspects of the urban fabric laden with the uses and values that informed their construction and assembly, but the life story of each building is too.1I’m referring, of course, to Stewart Brand’s How Buildings Learn. The whole vista will tell you stories (or serve as a sort of record) and whenever I’m out and about – whether in Ottawa, Toronto, or elsewhere – my eyes are peeled. It wasn’t an exceptionally long walk by my vacation standards, but it was a rich one. Source: Google Maps (Timeline). 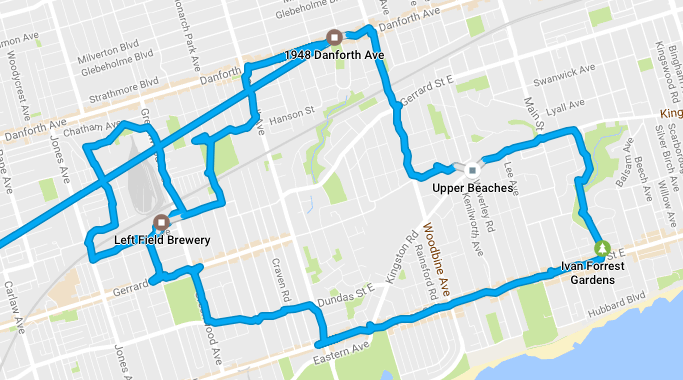 While in Toronto recently, I took a loopy and meandering walk around the area I was staying. It was my last day in town and I had a few goals in mind. The first was to take a walk around the Glen Stewart Ravine and Queen Street East in the Beaches so that I could take a gander at a few Littlest Hobo filming locations. The second was that I wanted to pop by Left Field Brewery to pick up a couple bottles that I am unable to get in Ottawa, a mission that was easily accomplished.2If you’re curious, Double IPA is my favourite style, so the aim was to pick up a couple of bottles of 6-4-3. The third was a bit more genealogical: a walk down Condor Avenue, where one of my ancestors, Harvey (and his son, Clark) Bradley lived during the 1920s.3A maternal great-great grandfather. He was a semi-pro hockey player, with the Philadelphia Arrows of the xHL. My great grandfather, Clark Bradley, used his childhood home for his address before he married. Source: Ancestry.ca. 31 Condor Avenue (right) in July of 2014. Image: Google Maps. A little taste of Affordable Ottawa in Toronto. The Phin Park Apartments (or Phin Park Project) was constructed in 1959. Image: December 2016. … I couldn’t help but do a double-take. To no small degree, walking along that pathway felt little different than walking down King George or Queen Mary streets in Overbrook. Part of Phase III (1955) of the Ottawa Lowren Housing Company’s Overbrook limited dividend project, located at King George and Lola streets. Image: August 2016. 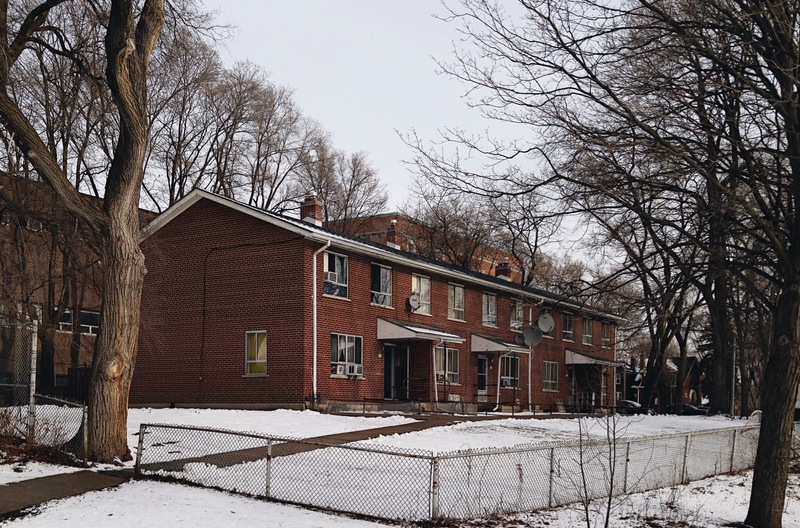 As it would turn out, it’s not just a basic money-saving building design that Phin Park and Overbrook share: they were also both the result of a municipally-owned limited dividend housing company. 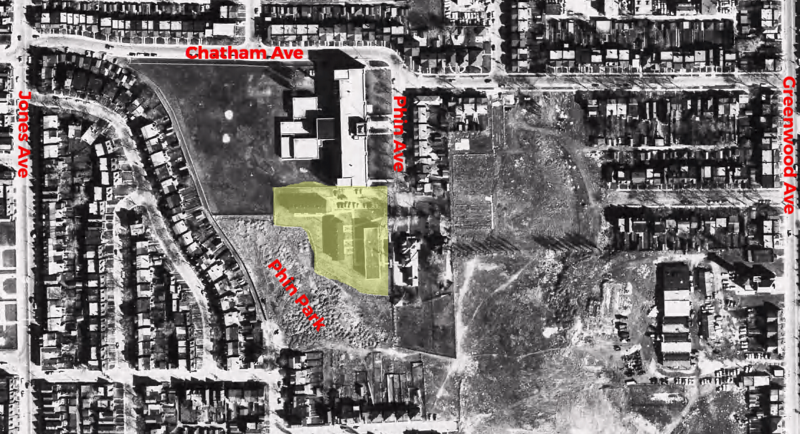 Phin Park Apartments (1959) was the City of Toronto Limited Dividend Housing Corporation’s second project after its much larger (and controversial) Moss Park project (1957/1959). The Ottawa rows pictured above were from Phase III (1955) of the Ottawa Lowren Housing Company’s Overbrook project. Buzzing through the housing files of the City of Ottawa, the CMHC, and the Ontario’s Housing Branch (forerunner to the Ontario Housing Corporation), it’s quite clear that there was much learning between cities across Canada for limited dividend housing projects. Not only is this learning reflected in the paper record, but it’s also reflected in the urban fabric. 1. ↥ I’m referring, of course, to Stewart Brand’s How Buildings Learn. 2. ↥ If you’re curious, Double IPA is my favourite style, so the aim was to pick up a couple of bottles of 6-4-3. 3. ↥ A maternal great-great grandfather.